Rich Tool Systems is your source for every product you need to see any project through from start to finish. We carry all the best top-quality abrasives, including file board sandpaper rolls. 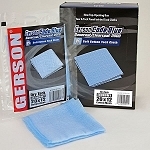 Stock up on sanding supplies now with our stick-on file board sandpaper rolls. These rolls are available in a range of grains from 36 grit up to 400 grit, and all are priced much lower than retail. They're sold in 25 to 40 yard rolls for huge savings. Just cut what you need. Fits all standard air file sanders and file boards. Our file board sandpaper rolls are made from strong, high-quality paper with a layer of film for additional durability and water resistance. Tough aluminum oxide grain provides a long life of fast cutting. No matter the job, you can find everything you need at Rich Tool Systems, all for great prices.